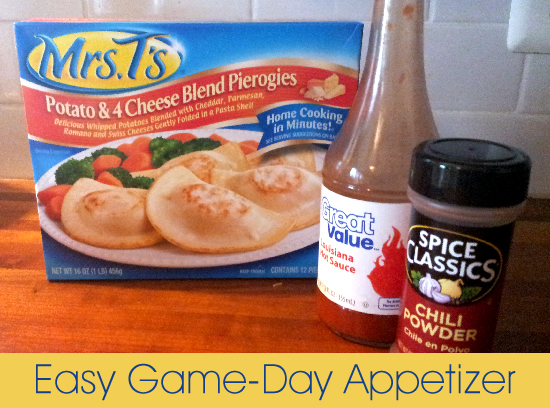 Buffalo Pierogies for Game Day – YUM! I participated in a campaign on behalf of Millennial Central Consulting for Mrs. T’s Pierogies. I received a product sample to facilitate my review and a promotional item as a thank you for participating. 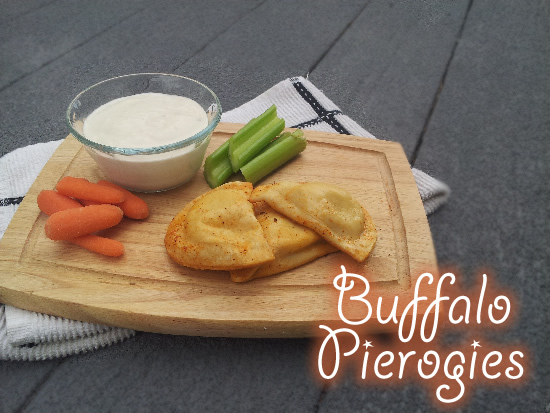 Yep, you read that correctly, those are Buffalo Pierogies. I know this may sound like a strange way to eat pierogies, but trust me, you HAVE to try them! This past weekend we had some friends over to watch the Eagles game and I wanted to have easy to make appetizers while we watched. I found the following recipe on the Mrs. T’s website and had to try it. It took very little time to make and bake, which was perfect because I’d rather be spending time with my guests. Let me tell you, these were a big hit! Combine oil, hot sauce and chili powder; toss with the pierogies. Coat a baking sheet with non-stick cooking spray and spread pierogies evenly on the baking sheet. Bake for 16 to 18 minutes or until pierogies are puffed and browned. For best results turn over once, halfway through bake time. Serve with blue cheese dressing, carrots and celery. Optional: Deep fry pierogies in 350ÂºF oil for 3 minutes or until golden brown, as directed on box. While I was on the Mrs. T’s website, I found a ton of recipes. Mrs. T’s Pierogies are available in 11 different flavorful varieties, including whole grain. I can’t believe the number of ways you can use them! Imagine a fondue party with Cheddar Fondue and Pierogies, or a summer picnic with Pierogy Slaw, or Slow Cooker Pierogy Lasagna for a dinner party! My husband has already requested the Pierogy Nachos and Pigskin Pierogies for the next football game. You should definitely check out the Mrs. T’s Pierogies website or follow Mrs. T’s Pierogies Facebook page to get more ideas. How would you use pierogies for your next get-together? Sounds good to me. I love pierogies!